The New Testament consists of first-century, seemingly first-hand accounts of the life, death, and resurrection of Jesus Christ. It also claims to be an eyewitness account and makes some mighty bold claims about what the authors saw and heard. Yet a first-century audience (that is, an audience which would have been able to call "shenanigans" if the authors were just making things up) believed these accounts, copied them, and spread them both textually and orally throughout the entire Roman Empire and to faraway places like India. That's a pretty good indication of credibility there. This doesn't, by the way, rely on you assuming a priori that the Bible is Scripture and therefore inspired; just that you approach it as you would any other historical text, since it's clearly arguing for what were then recent historical events, not telling some long-ago legend. On this Good Friday, the day Christians traditionally commemorate the death of Jesus on the cross, let's examine the evidence surrounding his death and resurrection. I'd like to look at five specific examples. In the Agony in the Garden, Luke mentions (Luke 22:44) that Jesus' sweat fell "like drops of blood." That's a medical condition called hematohidrosis, which the Indian Journal on Dermatology described as "very rare." It occurs under extreme stress in a handful of people. Now, St. Luke was a doctor (as St. Paul mentions in Colossians 4:14), which is probably why he's the only Gospel writer to draw attention to this fact: this is unlike what a first-century doctor would have seen in his day-to-day practice (and, as I mentioned, it's still very rare). So it's significant that this first-century source is describing a medical condition that was largely unknown, but which we now know to be stress-related. That is, the source is describing information that he would have been unlikely to make up, because even if Luke were somehow aware of hematohidrosis, why would he include that detail? To try and convince other first-century dermatologists? It's a detail which seems supernatural and incredible, not a detail which seems natural and credible... yet we now know it corresponds to modern medicine. This suggests that Luke's testimony is accurate: that there was a real Jesus of Nazareth, who really did sweat blood in anticipation of His Crucifixion. "Now it was the day of Preparation, and the next day was to be a special Sabbath. Because the Jews did not want the bodies left on the crosses during the Sabbath, they asked Pilate to have the legs broken and the bodies taken down. The soldiers therefore came and broke the legs of the first man who had been crucified with Jesus, and then those of the other. But when they came to Jesus and found that he was already dead, they did not break his legs. Instead, one of the soldiers pierced Jesus' side with a spear, bringing a sudden flow of blood and water. The man who saw it has given testimony, and his testimony is true. He knows that he tells the truth, and he testifies so that you also may believe. These things happened so that the scripture would be fulfilled: 'Not one of his bones will be broken,' and, as another scripture says, 'They will look on the one they have pierced.'" This is packed with evidence. First, the author is familiar with Jewish religious practices. He says in verse 31, "Now it was the day of Preparation, and the next day was to be a special Sabbath." That's a Passover reference, obviously, and it explains why Jesus' followers celebrated Passover a day before the Pharisees (they were of a Jewish school which always observed Passover a day early when it fell on the Sabbath). Third, the author is all too familiar with crucifixion. He's aware, for example, that the Romans broke the legs of their victims on the cross—the reason being that without the support of your legs, you can't pull your body up to breathe, and you slowly die of asphyxiation. Though it sounds counter-intuitive, lack of oxygen is what frequently killed the victims of crucifixion, not having nails driven through their wrists. Fourth, the author hints at several lines of Biblical fulfillment. The Passover Lamb's bones weren't broken (Exodus 12:46; Num. 9:12) nor were the bones of the Messiah to be broken (Psalm 34:20). And there is a strangely God-like prophecy in Zech. 12:10, that the Chosen One will "pour out on the house of David and the inhabitants of Jerusalem the Spirit of grace and supplication," while they "will look on me, the one they have pierced, and they will mourn for him as one mourns for an only child, and grieve bitterly for him as one grieves for a firstborn son." Given that the Christians believe that Christ is the only-begotten of the Father (John 3:16), this detail manages to fulfill all sorts of really intricate prophesies. If you think that this is easy, try it sometime: try and write a short fictional account of someone (anyone) living in the present who fulfills the Biblical prophesies, and make it believable. Finally, and this one blew my mind, the blood and water comport with medical evidence. After Jesus died, his body stopped metabolizing the water, so an upward piercing from a spear could have easily torn the lining of the stomach, causing the blood and water to pour out. John explicitly mentions this detail, but it's not one a fictional writer is likely to have thought of (unless he'd cut open dead bodies, which Jews were forbidden to do). So far, then, we have reliable evidence that there was a Jesus who knew (and seemingly dreaded) going to the cross, but went anyways, and was killed. Both Luke and John mention pretty specific medical details unlikely to be concocted. All of this suggests that Jesus really lived and really died on the cross. There are dozens more verses that support this point, besides the ones above, as well as extra-Biblical sources acknowledging that there was a Jesus who died on the cross. 'Take a guard,' Pilate answered. 'Go, make the tomb as secure as you know how.' So they went and made the tomb secure by putting a seal on the stone and posting the guard." So the soldiers took the money and did as they were instructed. And this story has been widely circulated among the Jews to this very day." Again, remember when Matthew is writing: he even gives a nod to it, when he talks about how rumors are still circulating "to this very day" about the guards. So we know the Tomb was guarded beyond any serious question. When he had said this, he showed them his hands and feet. And while they still did not believe it because of joy and amazement, he asked them, 'Do you have anything here to eat?' They gave him a piece of broiled fish, and he took it and ate it in their presence." This is one of the most important post-Resurrection appearances, from a logical standpoint. Jesus' twelve disciples are assembled, they see someone simply appear in their midst, and they're not sure if it's the risen Christ, or a ghost. So they put him to the test. Or, more precisely, he offers his hands and feet, and lets them touch him. Then, he takes a piece of their fish and eats it. To them, he was disproving that he was a ghost. To us, it also disproves the hallucination hypothesis. Hallucinations tend to be either auditory, visual, or tactile. That is, typically, a person hallucinating either sees or hears or feels something which isn't there. There are cases of hallucinations involving more than one, although I've never heard of any cases where one was all three. Certainly, there's no such thing, medically speaking, of twelve people simultaneously having a mass hallucination involving them all collectively seeing, hearing, and touching something which wasn't there. So the hallucination hypothesis is out. But just to put another nail in its coffin, Jesus eats a fish. So even if, contrary to everything we know about the relevant medicine, twelve people coincidentally had the same extremely rare form of hallucination, it would still not explain where the piece of fish went. They had a piece of fish, they watched him eat it, and there no longer was a piece of fish. And remember, they had the fish with them, so it wasn't like they hallucinated the fish, too. So the twelve disciples are either lying or actually saw the risen Christ. They're not just telling a pious legend nor are they confused about what they saw. There's just no way that they mistook something else for seeing, hearing, and feeling the risen Christ and watching him eat. In Acts 2, Peter gets up in Jerusalem during a religious feast, and loudly proclaims that Jesus Christ is risen, and that his tomb is empty. It's too early in history for Luke to be making the story of Peter's speech up, and it's way too early for Peter to be lying about the location of Jesus' body. After all, his tomb wasn't far away, and the men who put him there were almost certainly within in the city. Plus, as we've now established, there were guards present at the tomb, who could have also lead the curious to go see it. In sum, we know that (1) there was [or is] really a Jesus Christ who was crucified; (2) he really died on the cross; (3) there were rumors of a resurrection, and so guards were posted outside his tomb; (4) his disciples claim to have seen, spoke with, and touched him in risen form shortly after his death, and watched him eat; and (5) his tomb was empty. All of this points heavily to the fact of Jesus' resurrection. Certainly, it's the answer that the disciples swear up and down is true. And they're willing to go to their deaths for it, which suggests they at least think it's true. That is, they're not lying. (Note: Being willing to die for a claim doesn't ensure the claim is true, but it does strongly suggest one thinks it's true.) None of the disciples recant after Jesus' death, even though all but John are martyred for it. And remember: these men were one and all pious Jews, claiming that Jesus Christ is the One True God. If he's not, and they know he's not, they're about to be ripped apart by animals and go straight to Hell. Beyond this, none of the other explanations for this evidence even come close to making sense, particularly taking the full scope of evidence. That is, even if the Twelve hallucinated Jesus in (4), how would that result in an empty tomb (5)? And the famous "swoon" theory, that Jesus didn't really die, explains (5), but doesn't come close to make sense of (3) or (4) since, remember, Jesus appeared without walking in through the door, and it runs directly foul of (2) as well as common sense. Taken as a whole, all the evidence suggests that roughly two-thousands years ago, Jesus of Nazareth was crucified, died, and rose again on the third day, just as the Catholic Church has taught since then. Originally posted at Shameless Popery. Used with permission. It seems to me this argument relies too heavily on unstated assumptions that need a lot of support before being assumed. In '3', it is argued that guards were stationed outside of Jesus' tomb to ensure that his body isn't stolen and reported to be resurrected. This assumes that, prior to Christianity, Jews understood such a notion of resurrection. But, we know they did not. For them, resurrection was corperate and eschatological, not contemporary and individual. This is why the Gospels say the Apostles didn't understand Jesus' claims, and why apologists so frequently ask non-believers to account for the origins of the Apostle's belief in the resurrection. (N.T. Wright's work is definitive here) So, it's overwhelmingly probable that Matthew's testimony is fabricated. In '4', it is argued that the (11, since Judas died) Apostles saw and touched Jesus' resurrected body. This assumes that Luke's description is trustworthy. But, if we accept that, we have to say either that the Apostle's hallucinated, or that Jesus *really* did resurrect. But, what's more likely, that Luke's description isn't trustworthy or that Jesus *really* resurrected? Surely, there's nothing at all unreasonable about saying "I'm not sure"? Surely, it's not unreasonable for a non-Christian (whether theist or not) to find it more likely that Luke is unreliable (for some reason or other) than that an all-powerful, all-knowing, and all-good being decided for some reason to resurrect a 1st century Jewish reformer from the dead? "So, it's overwhelmingly probable that Matthew's testimony is fabricated." "The story [in Matthew's Gospel], obviously, is part of an apologia for the bodily resurrection of Jesus. It is an attempt to ward off any suggestion that the disciples had in fact stolen the body, which must have seemed the most natural explanation for the emptiness of the tomb. But, while the historian is always cautious about accepting obviously apologetic tales, there are further considerations which make it very unlikely that this one was actually invented from scratch within the Christian community. For a start, it is implausible to suppose that the whole story would have been invented in the first place, let alone told and finally written down, unless there was already a rumour going around that the disciples had indeed stolen the body. If nobody had suggested such a thing, it is difficult to imagine the Christians putting the idea into people’s heads by making up tales that said they had. Furthermore, a charge such as this would never have arisen unless it was already well known, or at the very least widely supposed, that there was an empty tomb, and/or a missing body, requiring an explanation. If the empty tomb were itself a late legend, it is unlikely that people would have spread stories about body-stealing, and hence that Christians would have employed the dangerous tactic of reporting such stories in order to refute them. Finally, the telling of the story indicates well enough that the early Christians knew the charge of stealing the body was one they were always likely to face—and that it was preferable to tell the story of how the accusation had arisen, even at the risk of putting ideas into people’s heads, rather than leave the accusation unanswered." "This assumes that Luke's description is trustworthy. But, if we accept that, we have to say either that the Apostle's hallucinated, or that Jesus *really* did resurrect." I completely agree. If Luke's account is reliable, the disciples either were hallucinating or they really did meet the physical, resurrected Jesus. "But, what's more likely, that Luke's description isn't trustworthy or that Jesus *really* resurrected?" I'm curious how you would calculate this probability. Such probabilities can only be calculated in light of the background information we have, namely the historical evidence. And the historical evidence seems to overwhelmingly point one way. There's simply no historical example of a mass hallucination which involves seeing, hearing, and touching a physically resurrected being, while the earliest texts we have about this episode confirm the resurrection hypothesis. "Surely, there's nothing at all unreasonable about saying "I'm not sure"?" Well, it depends how you define "sure." History isn't a science of certainty. We can only posit the best explanation based on the historical evidence. In this case, I think it's very reasonable to accept the resurrection hypothesis given the available evidence. "Surely, it's not unreasonable for a non-Christian (whether theist or not) to find it more likely that Luke is unreliable (for some reason or other) than that an all-powerful, all-knowing, and all-good being decided for some reason to resurrect a 1st century Jewish reformer from the dead?" Again, given what background evidence? This isn't really an argument or a hypothesis. Saying, "Surely, it's not unreasonable..." does nothing to prove, disprove, support, or cast doubt on any of the suggested hypotheses. I'm curious why you think it unlikely that "an all-powerful, all-knowing, and all-good being" would decide to raise Jesus, the purported Son of God, from the dead. It makes perfect sense to me and billions of other Christians. Brandon: I relied Wright's work to show that there is no way Jews, prior to Christianity, understood the idea of an individual, pre-eschatological resurrection. And yet, the author of Matthew says the Pharisees did. So, we know that Matthew's claim is false: the Pharisees said no such thing. My inference was that this casts doubt on the rest of Matthew's claim. 1. Matthew's story wouldn't have been invented unless some were accusing the disciples of stealing Jesus' body. 2. No one would accuse the disciples of stealing Jesus' body unless it were thought that Jesus' tomb was empty, or his body missing. 3. The early Christians thought the charge was serious enough to answer. A reasonable counter-explanation can go like this: the Apostles had no idea where Jesus was buried (since they fled). Therefore, they didn't know whether he received an honorable burial or not. But, they hoped that, being God's chosen one, he had. They thus began to reconstruct how things must have gone, given their knowledge of soceity at the time, and their belief in Jesus' relation to God. E.g. Any ol' Jew would have dishonorably buried Jesus for his blasphemy. Thus, the Jew that buried Jesus must have been different, a sympathizer. Moreover, because God would not let his beloved rot away like the criminal he was thought to be, God assumed Jesus' body. On this basis, the Apostles could confidently begin proclaiming Jesus' resurrection: it's how it must have happened. But, of course, the devil is in the details and over the next couple decades, those details needed to be panned out by the Christian community. E.g. Since women annointed the dead in Jewish society, what must the women have stumbled upon? Since Jesus had promised to be with them always (etc. ), how would his resurrected self fulfill this promise? And what about the Jewish claim that the disciples had just stolen the body? Remember that Matthew's Gospel was not written for the general masses, but only circulated through Christian communities, and *years* after the purported events at that, and in a completely different region. So, worries over mentioned characters falsifying the account seem misplaced. As far as your point about prior probability, that's precisely the issue I was raising: you won't find this case compelling unless your background knowledge is appropriate. For example, you pretty much have to be a theist. If God doesn't exist to your mind, there's just no way he did something like this. But, even that's not enough. Remember that article on the resurrection I submitted? We have to know why the God of natural theology would resurrect Jesus, and given how little we'd know about his motives, it's just hard to imagine. Thanks for the comment, Steven! I always enjoy dialoguing with you. The Pharisees . . . affirmed a future embodied existence, and seem to have at least begun to develop theories about how people continued to exist in the timelag between physical death and physical resurrection." It's therefore possible, Wright suggests, that the Pharisees had a developing though not fully-formed picture of individual resurrection. However, what I personally think is the most likely explanation of the Matthean story in question is that the actions of the Jews were not motivated by any knowledge of resurrection prophecies at all, but were simply an afterthought to prevent any possible trouble that could be caused at the tomb by the disciples during the feast. Note that the Matthean account doesn't say the guards *believed* in an individual resurrection, they simply recalled that Jesus, prior to death, claimed to rise on the third day. They therefore wanted to prevent anyone from artificially trying to fulfill that prophecy--hence the guards. "A reasonable counter-explanation can go like this: the Apostles had no idea where Jesus was buried (since they fled). Therefore, they didn't know whether he received an honorable burial or not." This is not reasonable explanation. The disciples didn't all flee Jesus. St. John (an Apostle) was at the Cross, along with Mary (Jesus' mother), and other loyal disciples not counted as part of the Twelve. Even more, Joseph of Arimethea (a secret disciple of Jesus) buried Jesus in his own private tomb. Finally, when hearing news about the empty tomb, the apostles Peter and John ran straight toward it, without apparent direction. They must have known, therefore, where the tomb was. It's therefore not reasonable to suggest that none of Jesus' apostles or disciples knew the location of his tomb. "On this basis, the Apostles could confidently begin proclaiming Jesus' resurrection: it's how it must have happened." I'm alarmed by your use of the word "must" as if your theory entails logical necessity. Unfortunately, it has numerous flaws. First and foremost, it's totally speculative. There's simply no historical evidence to support your preceding claims (e.g., a dishonorable burial for Jesus, no apostles at the tomb, etc.) Second, while your theory explains may explain the empty tomb it does nothing to explain Jesus' post-mortum appearances. It's explanatory scope is far smaller than the resurrection hypothesis. In the end, your speculative theory is both baseless and insufficient in accounting for the historical evidence. "As far as your point about prior probability, that's precisely the issue I was raising: you won't find this case compelling unless your background knowledge is appropriate. For example, you pretty much have to be a theist. If God doesn't exist to your mind, there's just no way he did something like this." This is not true. You don't have to believe in God to believe that the resurrection hypothesis is the most plausible scenario. You just can't have ruled out, a priori, the supernatural resurrection of a human corpse. Open-minded agnostics or pantheists who haven't ruled out supernatural events could accept that Jesus was resurrected from the dead. Of course atheists, who have a priori rejected God, will give the resurrection hypothesis no consideration. While understandable, that in itself is not an argument against Jesus' supernatural resurrection. "Thanks for the comment, Steven! I always enjoy dialoguing with you." "Note that the Matthean account doesn't say the guards *believed* in an individual resurrection, they simply recalled that Jesus, prior to death, claimed to rise on the third day. They therefore wanted to prevent anyone from artificially trying to fulfill that prophecy--hence the guards." I think the plausibility of your explanation depends on two things: (i) whether Jesus made the 'third day' predictions, and (ii) whether knowledge of these would compel the Pharisees to post guards. But, I don't think Jesus made such predictions because the Apostles failed to anticipate a resurrection. And even if he did, I don't think this would have encouraged the Pharisees to post guards "until the third" day for why guard the tomb only until the time when they should most be concerned about body theft? Moreover, the Pharisees had already been said to interpret the resurrection predictions as being about the temple and not his body (e.g.Mt 26:61). Why the change of mind? "This is not reasonable explanation. The disciples didn't all flee Jesus. St. John (an Apostle) was at the Cross, along with Mary (Jesus' mother), and other loyal disciples not counted as part of the Twelve." Maybe, but supposing that some disciples didn't flee Jesus' passion doesn't indicate that they knew where Jesus was taken after he died. "Even more, Joseph of Arimethea (a secret disciple of Jesus) buried Jesus in his own private tomb." I think Joseph's character was originally the pious Jew that the Apostles expected there to be in order for Jesus to have been honorably buried. "Finally, when hearing news about the empty tomb, the apostles Peter and John ran straight toward it, without apparent direction. They must have known, therefore, where the tomb was." Well, this presupposes the reliability of those accounts. The alternative I've offered is that this story represents the struggle of the post-Apostolic church to work out what would have happened to God's chosen one. "There's simply no historical evidence to support your preceding claims (e.g., a dishonorable burial for Jesus, no apostles at the tomb, etc.) "
Any Jew but Jesus' followers would have buried Jesus dishonorably, by placing him in a criminal's lot. Why? Because Jesus was found guilty of blasphemy (etc.) by the Jewish Court. That's why the Apostles had to postulate that the Jew which buried Jesus was a sympathizer. Otherwise, God's chosen one would have been buried dishonorably. As far as no Apostles knowing where the tomb was, this is why the synoptic Gospels have to specify that Jesus' women followers knew where he was laid (Mk. 14:47, Mt. 27:61, Lk. 23:55), a detail the Apostles would have given them. Interestingly, this becomes unecessary in John because Joseph is a "secret follower" of Jesus, able to relay this information himself. Most importantly, if Jesus' burial place was known, it would have been venerated by the early Christians, as all other relics were. But, it was not. Finally, as far as whether or not one must belief in God in order to be convinced that Jesus was resurrected, it depends upon *whom* is being said to have resurrected Jesus. Typically, it is God. (That's what the Apostles said) But, if you wish to construe it as a sort of supernatural force, it'll be even more problematic. For, why would some 'force' do something like this? Even for someone self-identifying as a Christian, I see no problem with saying, with regard to the specific details of the resurrection stories, "I'm not sure". I believe that something real happened after the crucifixion, and that whatever phenomena were associated with it, it was the definitive centering of reality around the person of Jesus of Nazareth. I believe that the phenomena were bodily, and that this was an affirmation of the goodness of creation. As for the finer details, I think an assessment of their historicity is important, but I agree that it would not make sense to re-orient one's life around the more fragile elements of the story. If the disciples really had recounted a once-in-a-universe event (and I believe they did), I would expect them to have trouble finding exactly the right words to describe it. Steven Dillon, one does not know who believed the resurrection or not and it makes no difference. It's clear that the Pharisees were aware of Christ's declarations and seeing them come true in the past and were afraid this one would come true as well when they asked for guard. It makes sense that Pilate and the keeper of the guards would comply. The New Testament consists of first-century, seemingly first-hand accounts of the life, death, and resurrection of Jesus Christ. To whom do the "accounts of the life, death, and resurrection of Jesus Christ" in the New Testament seem "first hand"? The above quote is the first sentence of the post, and it is all I have read so far, but Joe Heschmeyer has already lost me. David, it's deeply concerning that you would feel the urge to ignore the rest of Joe's article after reading one sentence. That seems remarkably close-minded to me. I have no intention of ignoring the rest of the article. No doubt I will have much more to say about it when I finish reading it. But I was struck by the fact that Joe Heschmeyer saw fit to assume, in his very first sentence, something that contradicts the consensus view in modern New Testament scholarship. This new book argues that the four Gospels are closely based on eyewitness testimony of those who knew Jesus. Noted New Testament scholar Richard Bauckham challenges the prevailing assumption that the accounts of Jesus circulated as "anonymous community traditions," asserting instead that they were transmitted in the name of the original eyewitnesses. To drive home this controversial point . . . . Even the knowledgeable believer is going to stop at the end of that first sentence and say, "Hey, wait a minute!" So it seems to me it is an inauspicious beginning for an article intended for discussion by believers and atheists! David, Matty is right in his comment below. By the word "seemingly", Joe simply meant that the Gospels present themselves as eyewitness testimony, and thus at first-glance it seems they are. It's true that at second-glance many historians reject this idea, although I agree with Bauckham that the evidence strongly supports the testimony hypothesis, even when the texts are more critically examined. I highly encourage you to read his book before making up your own mind on the question. Perusing the Amazon book description does not do the book justice. By the word "seemingly", Joe simply meant that the Gospels present themselves as eyewitness testimony, and thus at first-glance it seems they are. The Gospels have numerous scenes which it would be highly implausible to have been recounted by eyewitnesses. Is it conceivable that Jesus would have come back from the desert and given a blow-by-blow account of being tempted by the devil? Perusing the Amazon book description does not do the book justice. The point about the book description is that it describes the book as "controversial" and says that it challenges prevailing assumptions. It may be that prevailing assumptions are wrong, but my point is that Bauckham is giving a minority viewpoint. On a web site specifically dedicated to dialogue with nonbelievers and skeptics, it seems strange to confront them not with the prevailing views among Christians which all Christians can defend, but minority views which even most well educated Christians don't hold. It is one thing to argue that the Gospels are historically reliable. It is quite another thing to argue that they are eyewitness accounts. On a web site specifically dedicated to dialogue with nonbelievers and skeptics, it seems strange to confront them not with the prevailing views among Christians which all Christians can defend, but minority views which even most well educated Christians don't hold. As an ex-Catholic atheist I would find it far more interesting to see a explanation of why the Catholic Church disagrees with that consensus than more apologetics. In the meantime I'm going back to Bart Ehrman's latest book which seems appropriate although possibly heretical Easter reading." These verses, though very ancient, were probably not part of the original text of Luke. They are absent from the oldest papyrus manuscripts of Luke and from manuscripts of wide geographical distribution. "For in the memoirs which I say were drawn up by His apostles and those who followed them, [it is recorded] that His sweat fell down like drops of blood while He was praying, and saying, 'If it be possible, let this cup pass:' Luke 22:44, 42". Trypho is a fictional character, a Jewish Rabbi, whom Justin is debating to prove from the Scriptures that Jesus is the Messiah. This has absolutely nothing to do with opposing Docetic Christology!!! The Protestants have a stake in this argument only in that many Protestant bibles are based on the Codex Alexandrinus. I haven't cited any protestant theologians. In fact, Ehrman isn't even Christian. Moreover, it's not true that protestant scholars are notoriously weak in patristic studies: some of the most revered patristic scholars have been protestant, such as Phillip Schaff and Jaroslav Pelikan. And even if protestant scholars tended to be weak in this area, it wouldn't mean that Metzger followed in that trend or that Catholic scholars fared any better. Furthermore, recall that my citation does not say that the Lukan text is absent from all of our oldest and best manuscripts, but only some of them. So, pointing out that Sinaiticus is older is not to disagree with the citation. Finally, it's quite apparent from Justin's dialogue that he is going out of his way to emphasize Jesus' physicality. The suggestion is only that this could mean he was countering Doecetic claims *through* the literary device of a hypothetical opponent. Great post. Too many people who claim that all this was fabrication fail to see just how much would need to be fabricated to make this work. For the Christian, the retelling of the passion year after year only confirms that this was true, both literally and metaphorically. No person could have made this up; not even a genius of the highest caliber could make this up. Those who disagree and consider the gospels' account of Christ's passion the most elaborate scheme in the history of universe should pause and reflect on what their counterclaim truly rests on? Is it rational and fact-based, or willful and biased? This post also prompts believers to reconsider the Passion as a literal historical event as well as a metaphysical one. Too often one will throw around terms like Sin, Redemption, Resurrection, Grace, in this context and cloud up the cold hard reality of Jesus' very real suffering. This leads to skeptics thinking that the passion is a story that simply sounds to good to be true. However, such a story did not take place in the mind of some inspired writer but instead happened in the flesh before actual accusers and actual witnesses. They did not simply make a moral tale out of the crucifixion, but told everyone what happened to the best of their ability. Very little about this is idealized or simplified. It is truth in all its complexity. No person could have made this up; not even a genius of the highest caliber could make this up. Why do you say that? I should note that I don't believe the passion narratives were "made up," and I believe there is a core of historical truth the the arrest and crucifixion of Jesus, but I also see nothing that prevented certain "prophecies" from being "fulfilled" by either the evangelists believing (quite) sincerely that things must have happened according to "prophecies," or for the "fulfillment" of "prophecies" to have been the result of oral tradition adding details to an original narrative. Fourth, the author hints at several lines of Biblical fulfillment. The Passover Lamb's bones weren't broken (Exodus 12:46; Num. 9:12) nor were the bones of the Messiah to be broken (Psalm 34:20). 17 When the righteous cry for help, the LORD hears, and delivers them out of all their troubles. 18 The LORD is near to the brokenhearted, and saves the crushed in spirit. 19 Many are the afflictions of the righteous; but the LORD delivers him out of them all. 20 He keeps all his bones; not one of them is broken. 21 Evil shall slay the wicked; and those who hate the righteous will be condemned. 22 The LORD redeems the life of his servants; none of those who take refuge in him will be condemned. If anyone can explain to me how verse 20 predicted that no bones of Jesus would be broken when he was executed, I would appreciate it. How is Jesus or the crucifixion to be found in Psalm 34? Great post. Too many people who claim that all this was fabrication fail to see just how much would need to be fabricated to make this work. For the Christian, the retelling of the passion year after year only confirms that this was true, both literally and metaphorically. No person could have made this up; not even a genius of the highest caliber could make this up. Substitute any story from any religion and the same arguement applies: it would be impossible to fabricate the Qu'ran - look how much would have to be invented! Those who disagree and consider the gospels' account of Christ's passion the most elaborate scheme in the history of universe should pause and reflect on what their counterclaim truly rests on? Is it rational and fact-based, or willful and biased? All religions present the same kinds of evidence: personal revelation, records of revelations and miracles, holy figures, clean living, etc. Why should an objective observer accept one over the other? Or accept any of them? This post also prompts believers to reconsider the Passion as a literal historical event as well as a metaphysical one. Why I presumed that believers already considered the Passion to be a literal historical event. Too often one will throw around terms like Sin, Redemption, Resurrection, Grace, in this context and cloud up the cold hard reality of Jesus' very real suffering. This leads to skeptics thinking that the passion is a story that simply sounds to good to be true. Really? In what sense do you think skeptics consider the story "too good to be true"? However, such a story did not take place in the mind of some inspired writer but instead happened in the flesh before actual accusers and actual witnesses. They did not simply make a moral tale out of the crucifixion, but told everyone what happened to the best of their ability. Very little about this is idealized or simplified. It is truth in all its complexity. The current consensus of Biblical scholars is that the gospels are, at best, decades or even generations removed from the original events; written in a different language, not eyewitness accounts, and written by the most partial possible writers. Given that criteria, why not accept the Qu'ran as equally valid? Or the Rig Veda? The Tao-te-ching? In the Agony in the Garden, Luke mentions (Luke 22:44) that Jesus' sweat fell "like drops of blood." That's a medical condition called hematohidrosis, which the Indian Journal on Dermatology described as "very rare." Now I don't reject this automatically, but before I accept it, I'm curious to find out if there are any secular references to hematohidrosis. I went to pull up the IJD reference you mention, and it turns out to be a primarily religious article. The article gives one citation for the existence of hematohidrosis, which is a link to a Wikipedia page that cites ... this article. So at first glance we have nothing more here than a religious fraud. The article discusses a case report for a diagnosis of hematohidrosis: a 72-year-old man who reported blood stains on the front of his undergarments. Now the doctors never tested whether the blood belonged to the man, so we don't really know that anything happened. Tests showed his skin was normal. Presuming the blood was indeed his, it might have just been an enlarged prostate or a bladder infection. After all, if you look at the pictures it's obvious that the old man's undergarments are stained yellow as well as red. Is this the standard of evidence atheists should expect from Catholics? The term I see used more is bleeding diathesis, and it does not seem to be associated with stress so much as with cancer or severe infection. I'm not a doctor, so I don't know the details. I always interpreted Luke poetically. "Tears fell like blood from his heart" sort of thing. Thanks! Hm, the first link cites the original bad IJD article as its evidence for the existence of hematohidrosis, and its case reports are all bleeding from the ears. The second and third cases were chromhidrosis, which can look like blood, and that's probably as close as is needed for someone who is trying to find an interpretation that lets them continue believing. But yes, your interpretation makes the interpolation a more fitting part of the story. Here we go! This one looks like it's probably real. It's not sweat so much as bleeding from defects in mucosa and skin. Yes, this was my understanding. And definitely not caused by stress! and Immunoperoxidase Studies." American Journal of Dermatopathology v. 30 (2), April 2008, pp. 135-139," which was also included as reference number 6 in the IJD article. With photos, biopsy specimens with microscopic anatomical analysis, and other biochemical assays, the authors of this paper make a coherent case for this entity. Though they found no direct connection between the sweat glands and the blood, they found the blood channels emptying directly into the hair follicles, whence the blood exuded like sweat. They propose a different name "‘hematofolliculohidrosis' because it appeared along with sweat-like fluid, and the blood exuded via the follicular canals." The authors ruled out self-inflicted disease by hospital surveillance. The patient had a severe anxiety disorder, which when treated with anti-anxiety medicine, resulted in amelioration of the symptoms with no recurrence, indicating perhaps a relationship to stress. In this paper, they provide a number of references to modern day descriptions of this phenomenon in other patients. Actually, there are a number of reports of hematohidrosis from respected journals. It is marred by citogenesis and a lack of rigor (the authors didn't attempt to rule out the most common possible causes). It devotes more text to talking about Jesus and stigmata than to talking about the patient in the case study. The Discussion section is not based on the results of the case study. Yes, it's a bad article. In any case, if you're interested you can follow a link I posted elsewhere in the thread to photographs that look like a genuine case. Yes, Poetry. Like 'Blood, Sweat and Tears'!! “hematidrosis: An extremely rare condition characterised by the sweating of blood, which is said to occur when a person is facing death or other highly stressful events. It has been seen in prisoners before execution and occurred during the London Blitz. Thanks for the more relevant citations, and for the corrections. Like I said, I'm not a doctor. I find it incredible that stress would cause someone to sweat blood, but I don't really understand how the human body works, or how we sweat. Lots of what the human body does seems incredible. Maybe Jesus was very nervous and sweated blood. I think rather that Luke was being poetic, but who knows? Who cares? These were, component of  systemic disease,  vicarious menstruation,  excessive exertion,  psychogenic, and  unknown. The psychogenic were further subdivided into those that occurred only one time, those that recurred and the stigmatics. Acute fear and intense mental contemplation were found to be the most frequent inciting causes. The researchers divided up the cases into five groupings according to "causative factors." I have inserted the numbers 1 thorough 5 in brackets. It appears to me that they separated out category 4 (psychogenic), and it was among the psychogenic (not among the total number of cases) that the most frequent inciting causes were "acute fear and intense mental contemplation." One would have to have access to the full paper to know the actual number of cases in any category. You are correct. I wrote that too quickly. However, its a moot point. The fact that a significant number of cases of hematidrosis have been documented medically, and that some of those cases are believed to have been caused by acute fear and intense mental contemplation is sufficient to show that it could have happened to Jesus, especially in lieu of his particular circumstances. This is aside from the other comments you made regarding the manuscript evidence which I'll address in a separate post. What's interesting to me is that Joe has no problem with Jesus being supernaturally resurrected from death......but, sweat turning into blood?? Is that so much more unlikely that a documentable clinical diagnosis is needed to substantiate?? I don't think it's supposed to be sweat turning into blood, but just what appears to be bloody sweat. Thanks. Unfortunately that review article is behind a paywall, so I can't follow up to see if it presents good evidence. The abstract gives little hope of that. In any case, you can see elsewhere in this thread where I posted a link to photos of what appears to be a genuine case. Probabilities of events cannot be considered by themselves, but have to be considered in terms of prior knowledge and belief and new evidence. These probabilities then have to be compared to alternatives. Different people will have different beliefs, and so will assign different prior probabilities to various events. I would assign such a low probability of Jesus physically returning from the dead that almost any alternative explanation would be more likely. It would be more likely that Jesus never existed than that he physically came back from the dead. Count me as one who is reassured by your calculation. I would hate to find out that we actually expect to have two or more resurrections per universe duration. That's a completely fair way to interpret the estimation. My worldview allows for the possibility of a resurrection. It's possible. It's just exceedingly unlikely. I think that probabilities are therefore quite useful when comparing alternatives. It is not simply that the resurrection is unlikely. It is that it is much more unlikely even than that the Gospels were fabricated out of wholecloth and Jesus is a myth. Both are unlikely, but the resurrection is far less likely, given what I know and believe. If I thought that a miracle-working God existed, then his existence would provide a mechanism for the resurrection, and would change the probabilities. Alternatively, if I had more evidence of the resurrection (say, returning to the moment via a time machine and seeing the resurrection with my own eyes, or seeing some resurrections happening now), then I would probably accept that Jesus came back from the dead. I would nevertheless seek a natural explanation for resurrections. Is this an OK edit, Joe?? As I noted in another message, there is broad consensus that passage about Jesus allegedly sweating blood was a later addition by someone other than Luke. But for the sake of argument here, let us assume the passage was in Luke's original composition. The assumption seems to be that Jesus sweated blood during his agony in the garden, Luke reports that Jesus sweated blood, and since Jesus did sweat blood, Luke testimony is accurate and is proof. In any case, the question I would like to raise is how would Luke have known what happened when Jesus was alone—very much alone—in the garden? Jesus was the only one who would have known. And given the nature of the experiences the Gospels describe, it is difficult for me to imagine Jesus—after the resurrection—telling the Apostles how he suffered and prayed while they were falling asleep. First, Jesus would have been "rubbing in" how deeply the Apostles had failed him. And second, he would have been telling his most private inner feelings—how he begged God the Father to allow him not to go through the upcoming ordeal. It is difficult to imagine an account ringing true of Jesus telling the Apostles or anyone else what went on while he was alone in the garden. I made a similar observation with respect to how the writers of gospel would know about certain events and private conversations.. In the case of Jesus at the Well with the Samaritan woman I was justly corrected, as she could have told the villagers of their private conversation. However, although thankful that this was pointed out to me, I reserved further agreement with the possibility that I could still find more examples, and would check out this thesis further. How about, how did the Apostles know about what was said between Him and Satan when He was tempted? There is also a blind man who is healed outside the temple with no witness.. I shall be on the lookout for more examples, in future readings of the Gospel. David, 1) "there is broad consensus that passage about Jesus allegedly sweating blood was a later addition by someone other than Luke." Do you mean that there is "broad consensus among biblical scholars"? I respect biblical scholarship, but I don't think I can consider them the entire population of worthy commentators. Yes, I mean there is a broad consensus among biblical scholars. This suggests that Luke's testimony is accurate: that there was a real Jesus of Nazareth, who really did sweat blood in anticipation of His Crucifixion. One can argue that the majority of biblical scholars can be wrong and that Luke did indeed write the verses about Jesus sweating blood. But when almost any reference work or annotated Bible one consults about Luke 22:44 says the same thing—it appears to be a later edition to the Gospel of Luke—you lose credibility when calling it "Luke's testimony" if you don't at least mention that the majority of scholars do not think it was written by Luke. If you want to contradict the prevailing opinion, it seems to me you at least have to mention what the prevailing opinion is and why you disagree with it. In any case, the question I would like to raise is how would Luke have known what happened when Jesus was alone—very much alone—in the garden? Jesus was the only one who would have known. And given the nature of the experiences the Gospels describe, it is difficult for me to imagine Jesus—after the resurrection—telling the Apostles how he suffered and prayed while they were falling asleep. The passion story of Jesus is the oldest part of the Christian tradition to be preserved. Paul reports the earliest form of this tradition: Christ died for our sins, was buried, was raised on the third day, appeared to Cephas, and then to the Twelve (1 Cor 15:3b-5). This ancient tradition is remarkable for its brevity and lack of detail. To it Paul added other appearances: to more than five hundred believers at one time, to James, to all the apostles, and lastly to Paul (1 Cor 15:6-8). The emphasis is entirely upon appearances of the risen Jesus; there are no details about Jesus’ suffering and death. As the first generation of Christians began to die, a short narrative of Jesus’ passion developed: He was arrested, tried, and crucified. People yearned to know still more, so the narrative was elaborated to include the anointing, the Supper, and the plots to arrest him. . . .
What prompted this gradual development of the passion story? Though it may seem backwards to us, the passion story was a normal follow-up to the resurrection. The fact that Jesus was raised by God was the only thing the early Mediterranean Christians needed to strengthen their faith in Jesus. Perhaps it was when Jesus went to tell his Disciples not to 'sleep', that they saw the blood and sweat on his brow..
Also, every translation that I have come across, including a very literal interlinear one accompanying the Greek, says "sweat became like drops of blood," which is different from "sweat became drops of blood." Even if we accept that this passage dates back to the time Luke wrote his Gospel, it doesn't actually say Jesus sweated blood. It says something not particularly clear that might be interpreted to imply sweating blood. It might very well be just a simile. The above is not very important, and the question still remain as to how the person who wrote this passage knew what Jesus said as he prayed or knew an angel came to comfort Jesus. And this not the only example of details in the Gospels about which one can ask, "How did the Gospel author know that?" For example, who was the witness to Jesus in the wilderness being tempted by the devil? Indeed, and in most visual portrayals of Jesus speaking, the Apostles are not even in sight let alone within hearing distance. Considering scripture alone:. How would they know, for instance, what Pilate said if they had absented themselves from His Presence? Biblical text attempts to convey the thought of Jesus, as well as words and actions, something beyond mere factual reporting. Hope somebody does a proper study of this issue, someday. Thanks..
Well...in regards to Pilate's interrogation of Jesus, maybe like any other biographer/reporter, the writers of the Gospels interviewed persons who were present at particular events? Just because the some of the disciples of Christ were in hiding does not mean that the event took place in a vacuum. Luke, for example, seems to have interviewed many persons while writing his Gospel. Luke, for example, seems to have interviewed many persons while writing his Gospel. Can you name a few people whom Luke "seems to have interviewed"? The issue here is whether Luke and the other evangelists were writing "theology" or practicing a kind of journalism. When the evangelists wrote details that it seems unlikely they could have known, we may conjecture that they were making theological points, not giving historical details. So only if you believe that the evangelists were highly conscientious journalists does it make sense to say that because one of the Gospels contains details that only Mary could have known, the evangelist must have interviewed Mary to get those details. Also, it must be remembered that the Gospels were written 30 to 70 years after the events they recount. The evangelists could very well have been going by "common knowledge" supplied by oral tradition dating back 30 to 70 years, tradition that could have been elaborated on in the process of being passed down. I can't thing of any telltale signs that the Gospels were written based on interviews with the principals. They are all third-person omniscient narrations. Luke was an educated Greek physician who intended to write an account based on his own investigations..."With this in mind, since I myself have carefully investigated everything from the beginning, I too decided to write an orderly account for you, most excellent Theophilus,", One way of determining who Luke may have interviewed is to look at accounts in Luke that belong exclusively to Luke's gospel. Generally speaking, we then get accounts connected to the women who followed Jesus such as Mary (the mother of Christ), Joanna, Susanna, etc. Joanna was the wife of Herod's steward Chuza and may have been the source of some of Luke's Herodian material. Luke and Acts are generally dated to about 60-64 AD (although the gathering of information for the gospel would have started earlier. maybe 54 AD or so) and are within a generation of the events in questions, which for any "non-biblical" account of a person/event would be considered a reasonable source of historical information. I return here after reading David Nickol's post below. I appreciate very much his distinction between journalistic reporting and a dramatic narrative whose purpose is primarily theological. I think that distinction explains a lot, and is one of the reasons why I would like to see an in depth study made on sheer empirical 'evidence'. As far as the possibility of the disciples having access to such events as the saying of Pilate, I remain quite skeptical. Politically, for one thing, they are on the 'other side of the fence', so to speak. I cannot imagine them mingling with the crowd who called for the freeing of Barabbas any more than I can visualize any close physical proximity between the apostles and the soldiers who guarded the emperor. Granted there are depictions as in a film I saw where the guard who pierced the side of Jesus, bowed down in utter 'obedience' when the blood splattered upon him. But even here, or rather especially here, I would consider such stories anecdotal at best. Luke, of all the gospel writers, I understand to have been quite renown as a Roman writer/philosopher/poet before he became a Christian. If you know any details here, please pass them onto me. Thanks. Luke was a physician and educated Greek scholar who travelled with Paul and had access to contemporary sources of information. The recipient of the gospel, Theophilus is debated...may have been a Roman official, a jewish priest (Sadducee), or whatever. However, it is possible the Luke had access to official accounts and witnesses in the Jerusalem government besides the disciples. It seems he also had accounts from the women who followed Christ absent in the other gospels. I take your reply as a cautionary note that it is just as possible to speculate about the writing of the gospels as it may have been by the gospel writers themselves to find evidence on the 'private communications' Jesus made within those gospels. However, it is possible that further scholarship based on textual analysis could result in clearer distinctions being made between the theological and historical aspects. I am not such a 'scholar', but am merely commenting on obvious discrepancies. With respect to what I said about anecdotal stories, for instance, such personal accounts can lead to finding more weighted evidence in many cases. Thank you so much for your comments. would have no way of knowing whether it was really blood or just looked like blood. sweat. What you would see would be better described as “like blood” than blood. The apostles Peter, James, and John were close by Jesus and they kept falling asleep, so they were not asleep the whole time. Jesus appeared to the disciples over the forty days after his resurrection and taught them. I see no reason that he would not describe his Passion in full to them. I see no reason that he would not describe his Passion in full to them. So you find it plausible that Jesus told the events of the Agony in the Garden to his followers after he rose from the dead, and the Gospel authors dramatized what Jesus told them without mentioning that Jesus was the source? Unless I have overlooked something in the survey I just did, in the Gospel accounts of the resurrected Jesus, he says nothing about anything that happened to him during his earthly life that we don't already know. He says, in fact, almost nothing, and certainly nothing that we might want to hear from God incarnate who has risen from the dead. Of course, the Gospel accounts are so relatively spare that you can claim Jesus (or Mary) provided all kinds of details to the disciples that somehow got handed down to the Gospel authors and were dramatized in the Gospels. But I don't seen any indications in the Gospels themselves that this ever happened. I suppose if you are already committed to the Gospels as faithful, historical accounts, you have no alternative but to assume that Jesus (or Mary) is the source of a great deal of information that could not otherwise be known. But that seems to me to be a matter of religious faith in the Bible motivating you to invent explanations for which there is no evidence. Acts 1:3: "He presented himself alive to them after his suffering by many proofs, appearing to them during forty days and speaking about the kingdom of God." Why *not* talk to them about everything? Why could not Luke have heard from John or directly from Mary about Jesus' early years? John looked after Mary. > "But that seems to me to be a matter of religious faith in the Bible motivating you to invent explanations for which there is no evidence." Can't that just as easily be flipped around on you, your lack of religious in the Bible motivating you to interpret the text in a much different way? Having been raised a Catholic and gone to Catholic elementary school and high school, I was raised to believe much what you apparently believe. Those beliefs began to change some time in the 1970s when I read the volumes from the Pelican New Testament Commentaries Saint Mark, Saint Matthew, Saint Luke, and Saint John. Everything I have read since has led me to the position that the Gospels are not eyewitness accounts. I read almost nothing but "mainstream" scholarship, a great deal of it by Catholic authors. I rely on the New American Bible, the New Jerome Biblical Commentary, the (other) works of Raymond E. Brown and Joseph A. Fitzmyer, the Anchor Bible volumes, Dictionary of the Bible by John L. McKenzie, S.J., the volumes from John P. Meier's A Marginal Jew, and a number of other standard works. I don't read books that "debunk" religion or the Bible. I don't read anything by "mythicists." I acknowledge being very skeptical about the truth claims of the Catholic Church, but when it comes to what I believe about the Gospels and how they came to be written, none of my opinions would be at all controversial with mainstream Catholic biblical scholars. As far as I know, I hold no opinions about biblical scholarship that would conflict with what I would learn if I took an Introduction to the New Testament course at any major Catholic school in the country (Catholic University of America, Notre Dame, Georgetown, Fordham, etc.). I believe that on biblical issues, I am in the "mainstream" of biblical scholarship, as are the scholars that produced the New American Bible, but the "mainstream" of Catholic biblical scholarship is too "liberal," or it's even "heretical," according to a small number of voices (but very key ones) here at Strange Notions. If these teachers teach that the events portrayed in the Gospels are simply made up and not true, I don't care if they are at ND or where ever. My problem with the NAB was not the translation but the notes in the original edition I read maybe 20 years ago. I don't find those problematic notes in the current edition the USCCB publishes on-line. My problem with the NAB was not the translation but the notes in the original edition I read maybe 20 years ago. I'm curious. Did you have a problem with their scholarship, weaknesses In their methodology? What is the consensus of catholic biblical scholars on these issues in 2014? The schools you mention are Catholic in name only. Many practicing Catholics would opt instead to attend one of the smaller Catholic schools, like John Paul the Great in California, St.Augustine Institute in Denver, Franciscan University in Steubinville, OH, etc. where there is a much higher concentration of talent in biblical studies and loyalty to the Church. Bear in mind also that the Church has a 2000 year long legacy of brilliant theologians, Church Fathers, and Doctors of the Church. We're not going to abandon that legacy of intellectual thought just because some contemporary theologians have gone of the deep end when it comes to using some of the newer methods of biblical exegesis developed in the last half of the 20th century. On what basis do you conclude that "there is a much higher concentration of talent in biblical studies" at the schools you mentioned? How do you define "talent in biblical studies"? The schools you mention are Catholic in name only. In other words, you are a real Catholic, and any Catholics who do not agree with you are "Catholics in name only." I have seen this kind of response so many times that it no longer surprises me. You are willing to "excommunicate" the US Conference of Catholic Bishops, all the scholars who prepared the New American Bible, and the finest Catholic universities in the country from the Catholic Church in order to defend your idea of what real biblical scholarship is. How can you talk about "loyalty to the Church" when you are willing to throw so many people and organizations under the bus in the name of defining your own brand of Catholicism and claiming only you are right? The No True Scotsman is a time-honored tradition; not just with Catholics, or even theists, of course. "Other ancient authorities omit verses 43 and 44"
So, the NAB says they were probably added to some manuscripts but the RSV says, no, they were probably omitted from some. What proof do you have that the NAB is right and the RSV is wrong? My basic point is that this is a disputed passage. No one can prove anything about it, but there is universal agreement among textual scholars that solid translations like the RSV and NAB must treat it as a disputed passage. And yet Joe Heschmeyer uses "The Sweat Turning to Blood" as the first of his five arguments for the Resurrection. If you are going to make a case for the accuracy of biblical accounts, why use a passage with a detail the appears in only one of the four Gospels and the authenticity of which as an original part of Luke's Gospel is in doubt? If you are going to make an argument for the Resurrection, you need to build it on a strong foundation. This passage in Luke does not provide a solid foundation. I am open to arguments that certain strands of American Catholic higher education are somewhat disconnected from both the sensus fidelium and the magisterium. I think it is fair to lay some (not all!) of the blame for that disconnect at the feet of the institutions that you are criticizing. If you want to make such an argument, I respect that, and I will probably even nod my head a little bit as you make your case. But please, can you not find a less divisive way of making your point? The people who run, and teach at, and study at these institutions were baptized into the same mystical body that you were. They are not "Catholic in name only". Let's speak about each other in ways that recognize the reality of our Catholic unity. David is correct - you offer the "no true Scotsman" defense: "well, they're not REALLY catholic." This is a classic fallacy. 1) Is the passage authentic? Ehrman claims that this detail is an addition because "the passage is not found in some of our oldest and best manuscripts," by which he means texts like the Codex Alexandrinus and Codex Vaticanus. But in fact, Justin Martyr (100-165) writes that "in the Memoirs [Gospels] which, as I have said, were drawn up by the apostles and their followers, [it is recorded] that sweat fell like drops of blood while he [Jesus] was praying, and saying, 'If it be possible, let this cup pass'." And Irenaeus writes in c. 180 that Christ's sweating of blood disproves the Gnostic claim that He didn't really come in the flesh. These references are actually older than Alexandrinus or Vaticanus by quite a bit. So this, coupled with the fact that we find these verses in several families of manuscripts across various language and regions, recommends their reliability. 2) How could Luke know? Obviously, this detail would have had to have come from Jesus (unless the Apostles witnessed the bloody sweat upon His return). There are a few Scriptural references to Jesus teaching the Apostles after His Resurrection (e.g., Acts 1:3, Luke 22:27). Acts 1:3 describes Jesus as spending 40 days with the Apostles teaching them. There are only two details in the Gospels that seem to have come from Christ directly: the details of the agony in the garden, and the temptation in the desert. Both of these highlight Christ's humanity, which makes sense given their Author. After all, while the followers of Christ referred to Him primarily as "Son of God" (a title He acknowledged), He seems to have preferred to call Himself "Son of Man" (a Divine Messianic title that kept His Humanity in full view). So I'd say that this has the hallmarks of Christ's own Authorship, to the extent that we could identify such a thing. As for the idea that it's rubbing it in, it all depends on how it's breached. Look at how gently Christ addressed the issue of Peter's denial in John 21: He prepares a charcoal fire (John 21:9), just like the one that Peter denied Him by (John 18:18, the only other time that charcoal fires are mentioned in Scripture). Then He asks Peter three times if he loves Him, which obviously recalls Peter's three denials. The whole time, He never actually says anything about the denials. He just deals with them in a gentle and pastoral way. So there's no reason that He couldn't deal with the sleeping in the Garden gently, as well. Beyond that, of course, we can't say much." "The New Testament consists of first-century, seemingly first-hand accounts of the life, death, and resurrection of Jesus Christ." Actually, we know they were NOT first hand accounts. The earliest texts ever found were written in Greek and written many decades after the supposed events took place. I can't see how these text can then be used as evidence of anything other than what the unknown authors themselves either believed or simply made up as a work of fiction. This is called hearsay evidence and is inadmissible in a court of law. Why should it be admissible here? If we applied this universally we'd have to discard most of human history. Not really, There is a lot of first person writing in History as well as physical evidence to back up the writing. I didn't say all, now did I? Of course don't periods are better covered than others. But ancients history's in worrisome shape. Solange is right. In the OP, I suggested treating the Biblical texts like we would any other first-century texts. If there's a reason not to, I'd like to hear it. Berati, what you're suggesting would actually destroy more than just modern history (and I say this as someone with degrees in both law and history), but every major field of inquiry. For example, science textbooks are "hearsay," since they're not reporting on their own findings. And even if they were, it would be an out-of-court statement not against party interest, so it wouldn't be admissible anyways. The Federal Rules of Evidence are great, but a bad standard to do academic research by. That said, it's more than fair to debate the reliability of the texts by arguing that they're second- or third-hand, etc. If you have some sort of theory for how the New Testament texts arose and duped so many early witnesses, I'm game to hear it. Of course, even if you are skeptical of the NT texts as a whole, that doesn't mean disregarding every detail, right? I see the phrase "we know" and "a lot" here, but I suspect the scholarship is not as universal in support of your point as you are implying. When I see these phrases I am inclined to ask "who is we" and what is "a lot" and feel like someone is trying to argue via intimidation rather than otherwise. Everything I have said is easily verifiable and is agreed upon by religious historians. Nothing I have said is controversial. Look it up. I have and I disagree (that all agree and that there is no controversy). Need we argue about the word controversial? There are still people who support a flat earth, does this make a round earth controversial? Disagreement with you equivalent to believing earth is flat? I don't really want to indulge in a fruitless exchange of insults. God bless. There was no insult, merely an analogy. All my statements were inline with the consensus view of historians including deeply religious historians. The fact that you can find someone, somewhere on the internet who believes otherwise does not create any controversy. There are still people who deny germ theory and have websites devoted to this idea. By your view that makes germ theory controversial when we both know it's not. I'm sorry if these facts cause you anguish just because they don't support your beliefs. Because this is not a court of law. There is no reason why the rules of evidence for courtroom trials should be used for anything other than courtroom trials or proceedings very much like them. Just because its not a court of law doesn't mean we should disregard the logic that goes into making the rules that the courts apply. Hearsay is not allowed for a reason. The evidence required to avoid, say, accidently executing someone for a crime he or she is innocent of is by necessity much higher than the standard for historical debate. if we disregarded all sources that cited earlier sources (sometimes where such earlier sources are lost to us) we would, as M. Solange O'Brian noted, be forced to disregard a good deal of potentially useful information. Hearsay is not allowed even in civil suits but yes, in history we sometimes grasp the only straws available. However, it does not follow that we can then go on to say that there is strong evidence that a particular person broke the laws of physics, biology and logic based on such shoddy "evidence". No one is saying you can't believe whatever you want to believe, but to pretend that there is strong evidence supporting these stories is a lie. It's hearsay from an unknown source. To anyone without an agenda that amounts to no evidence at all. It's obvious that many christians are more than willing to lie to themselves about the veracity of the evidence just so they can feel good about their beliefs. Where is the intellectual honesty? As Christians shouldn't you just be saying you take it on faith rather than try to pull the type of sham that this article represents? Say I have evidence that makes me about 95% sure (or 88% sure or some other reasonably high percentage) about a particular issue. I would like to act based on my beliefs, not dither around for my whole life waiting for 100% certainty (rare, to say the least, on any issue). So I make a decision to live as if the belief is true. I assume, for example, that I actually exist, that other people exist and that I can interact with said persons, that a particular plane will not randomly fall out of the sky, that a particular bridge will not collapse if I drive over it, that God exists, that the Universe is not random, etc. Faith might be partially defined as the bridge that allows me to act on something I am reasonably certain of as if I am 100% certain. In a like way, I think there is reasonable evidence to assume that the gospels have historical validity as a whole and support the resurrection of Christ. I do not do this to "feel good" about my beliefs (sometimes these beliefs can be a bit inconvenient as they get in the way of doing whatever I damn well please) and I do not consider this as "lying to myself" as I try to be aware at all times of the possibility of error. I don't see much in your last paragraph that actually counts as an argument...although I do see insults. God bless you but I am ending this particular thread here. "Say I have evidence that makes me about 95% sure (or 88% sure or some other reasonably high percentage) about a particular issue. I would like to act based on my beliefs, not dither around for my whole life waiting for 100% certainty"
I agree with this, but you don't have that kind of evidence in this case. What you have is ancient hearsay from an unknown source claiming that the laws of physics, biology and logic have been broken. Extraordinary claims require extraordinary evidence but you don't even have normally acceptable evidence. Again, I'm not saying you can't believe whatever it is you want to believe even if you have no evidence, but to say that strong evidence (80%+)exists is a fabrication and you should not be indulging in this type of fabrication. It is your opinion that the evidence is not reasonably favorable toward the historical validity of the gospels (I gave no % for this although I think the percentages are reasonably favorable). I don't really want to get into a "yes it is reasonable" versus "no it is not reasonable" debate here as that will lead nowhere. We could debate "argumentum ad populum" (appeals to popular belief) and "appeals to anonymous authority" versus valid appeals to authority. (i.e. If you give me an actual historian who believes a particular thing, I will attempt to address such an argument. Otherwise....) I suppose one could debate the notion of “hearsay” versus historical primary, secondary and tertiary historical sources and to which of these categories the gospels fall into (I suspect they fall into all three). Note that all three source categories may be considered valid historical sources. "It is your opinion that the evidence is not reasonably favorable toward the historical validity of the gospels"
This is not a matter of opinion it is a matter of fact. Not sure of your point here? The date of a particular manuscript copy, while interesting, does not indicate the date of original authorship and I was already aware of the various scholarly notions as to the dating of the gospels...all of which are close enough, by historical standards, to the actual events to be considered reasonable. Consider, for example, Corinthians (dated 57 AD) and note I Cor 15:6 that notes that first hand witnesses were still alive at the time Paul wrote said book. Since Mark is 60-70 AD, the author of said book could also have found such witnesses. John the Apostle may have lived to around 90-100 AD, which overlaps most of the Gospel dates in your article. [Other approximate dates of death are Peter 64-67AD, Paul 67 AD] There is also the possibility of data being gathered by the authors for years prior to the actual compilation of the final books. The point is and has been all along that the gospels are not eye witness accounts.They're hearsay and we don't even know who it was reporting this hearsay. This is not an opinion, it's a fact. Not only is this not reasonably favorable evidence, it is not even normally acceptable evidence for any claims let alone claims of extraordinary supernatural activity. You are still making vague pleas to anonymous authority. A meaningless statement from someone who insists everyone obey an unprovable ultimate authority or face eternal torture. uhh... Read the post just before mine to find the start. And BTW, what I wrote is the christian ethos. Its not an insult if its true. I would disagree (as a former protestant and current catholic) that your comment summarizes the "Christian ethos", It seems the distortion of it. And my prior post was just pointing out a logical fallacy, which you may take as snarkiness if you wish. I think you're missing something here....the authors of the New Testament claimed either to be eye witnesses (i.e., Matthew, John, James, Jude, Paul) or to have been closely associated with the eye witnesses (Mark, Luke). That is first hand evidence. The fact that the letters we have were written by them 15 to 40 years after Christ's death doesn't change that. We have good reason to believe that there were earlier written documents that have never been found. But bear also in mind that society back then was mostly illiterate and people relied heavily on verbal communication and memorization, so we wouldn't expect there to be much in the way of written communication. That seems contradictory: we have good reasons to believe there were earlier manuscripts, but there's good reason that there are no manuscripts? You're wrong on the facts. Mathew, John, James etc... were not the writers of the earliest texts. Those texts are only said to be attributed to them. In other words someone said that that's what Mathew, John etc... said. No evidence even of this exists because no one knows who wrote the texts that were supposed to be attributed to those people. You're also mistaken on the dates. The earliest texts date to 70 years after said events at best. That's like accepting what an unknown person today writes about what some else is supposed to have said happened in 1944... as eye witness testimony. That is just not acceptable. The claim that the earliest New Testament texts date to 70 years after said events at best is long discredited. In my left hand is a copy of Redating the New Testament, in which even John A.T. Robinson (one of the leading liberal scholars of the mid-twentieth century) concedes that the late dating arguments are specious and superficial. Improved archaeology has more or less destroyed the late dating argument. The Rylands Library Papyrus P52 dates to c. 125 A.D. It's a copy of part of the Gospel of John found in Egypt... which means that copies of the Gospel of John (one of the last Books written) had already made it to Egypt by that time. Plus, other first century texts, like 1 Clement and the DIdache, make allusions to the New Testament. As for authorship, the early witnesses are unanimous that Matthew, Mark, Luke, and John wrote their respective Gospels. There's no dissent on this score. The consensus of Biblical scholars remains that the Gospels are at least 30-60 years older than the events they purport to depict (Mark being the earliest and John being the latest). They were written in Greek, and again the current best scholarship (check the New Jerusalem or the Oxford Annotated Bible (the only two my dad has on shipboard) for further details. And there is tremendous dissent on who actually wrote them; but the consensus is that they are NOT written by those whose names were attached to them - in the second century, I believe. Mr. Robinson wrote his book in 1976 and it never gained any traction in the historical community. Is this your idea of "long discredited"? Egypt, Judea, Greece.. all were within easy trading distance. Why would you think that taking 70 years is a short time for a story to have spread there? And why would you list this document as destroying the late dating argument when you yourself already date it to more than the 70 years mentioned? In fact, there is no dissent that the original manuscripts of the New Testament books do not survive today (If they ever existed at all). What survives are copies with authors unknown. There aren't any independent witnesses that Mathew, Mark Luke or John wrote a single word. I agree that those texts were not signed by anyone. However, it is noteworthy that there was a consensus in the early church that those documents were in fact written by those authors. You didn't have one group claiming one author and another group claiming a second, etc. If you research the subject of historical dating of the New Testament texts, you will find that there is a range of dates given by different biblical scholars that span the time period from the late 40's AD to the end of the 1st century. I'm curious where you got such a late dating, i.e., "the earliest texts date to 70 years after said events..." I've never heard that before. There is plenty of historical evidence to support the earlier dating I mention. For example, In "The History of the Church", Eusebius says that Matthew's Gospel was written around the year 48 AD, and he gives the dates of Paul's and Peter's executions in Rome under Emperor Nero of 67 and 62 AD respectively. So, how could Paul have written his Epistles after the 60's AD if he was dead? But even if I accept your late dating, you still haven't made a case that the New Testament documents are untrue or inacurate. If what you are saying were true, that would be quite problematic for ancient historians as most of what we know about ancient history was written and passed on to us by people that lived hundreds of years after the actual events or people lived. He is referring, I think, to actual manuscripts, the earliest of which are 1st century. New Testament documents are untrue or inacurate." Why do believers constantly insist that everyone else has to prove a negative? Here's why. You assume everything you believe is true without having to prove it first. It makes any discussion with you useless. "The benefit of the doubt is to be given to the document itself, and not arrogated by the critic to himself". I find atheists regularly attempting to flip this principle on its head. It is only fair that you judge the Bible by the same standards that historians judge all ancient historical documents. "Do you assume that everything you read is false unless the author proves its true?? Do you assume that everyone is lying to you unless they prove they are telling the truth???" Are you a mormon? You should be by your logic as the claims made in the book of mormon have never been disproven. It depends on the claim being made. If my wife tells me she saw my son at the mall, I believe her. If someone says I have to obey certain rules or be tortured for eternity... I want proof and lots of it. Not twisting your words just asking you to be consistent. "I simply pointed out that the skeptic has the burden to examine the evidence and prove the evidence untrue, or else except it"
We only accept this extremely poor methodology in ancient history because there is no other choice. But don't expect it to be very convincing. Unidentified hearsay evidence as in the bible is accepted by historians both religious and secular as evidence of the historicity of jesus. But that's it and even then, it's not unacceptable to have serious doubts. This DOESN'T apply to any supernatural claims made in the bible. If you want to read the bible like it's a science text book you'll have to come up with scientific evidence which under no circumstances includes ancient hearsay evidence from an unidentified source. If you're saying you need more than what is in the Bible to substantiate the supernatural claims, I don't disagree with that. I did not rely on the Bible alone when I converted to Catholicism from atheism. That claim is not evidence - unless you'd care to also accept as truth Mohammed's claim to have received direct revelation? But that's all we have: people claiming incidents. You appear to be uncritically accepting one set of eyewitnesses (who we know are not eyewitnesses), and discarding another, simply in the grounds that you prefer one story over the other. Just a note...Jewish oral tradition was highly sophisticated and designed to prevent the loss of information. I agree. This is a fact that is often lost on contemporaries that are dependent on other forms of communication. On this Easter Vigil, I leave you the words of Freeman Dyson, colleague and kindred spirit, on his belief. He captures what I have taken from these discussions, and what I have come to appreciate about Christianity, and especially Catholicism. I wish all here a very happy Easter. anthropologists observing the rituals and liturgy of an alien culture. satisfying or intellectually compelling, is actually true. It seems to me (above and beyond it's other claims, which I can address separately), that this post offers a trivially true argument: if the gospels are correct in all detail (the basic assumption here), then...the gospels are correct and Christ was god. Joe addresses the question of whether the narrative is consistent, but that is far removed from a good reason to accept it as true. After all, similar logic would lead us to accept the Qu'ran, the Upanishads, and the Book of Mormon. "This doesn't, by the way, rely on you assuming a priori that the Bible is Scripture and therefore inspired; just that you approach it as you would any other historical text, since it's clearly arguing for what were then recent historical events, not telling some long-ago legend." (5) That the Tomb was empty, as Peter testified on Pentecost. (1) and (2) get obscure medical details correct in a way that suggests that they're eyewitness testimony, rather than imagination. For (1), I said: "So it's significant that this first-century source is describing a medical condition that was largely unknown, but which we now know to be stress-related. That is, the source is describing information that he would have been unlikely to make up, because even if Luke were somehow aware of hematohidrosis, why would he include that detail? To try and convince other first-century dermatologists?" For (2), I mentioned that "the blood and water comport with medical evidence. After Jesus died, his body stopped metabolizing the water, so an upward piercing from a spear could have easily torn the lining of the stomach, causing the blood and water to pour out. John explicitly mentions this detail, but it's not one a fictional writer is likely to have thought of (unless he'd cut open dead bodies, which Jews were forbidden to do)." For (3), Matthew explains to his readers that the popular Jewish account (that the body had been stolen while the guards slept) is false. But the important fact is that it shows that both sides of the first-century debate acknowledged the existence of the guards. For (4), I explained why the hallucination hypothesis failed, meaning that the "disciples are either lying or actually saw the risen Christ." Finally, for (5), "It's too early in history for Luke to be making the story of Peter's speech up, and it's way too early for Peter to be lying about the location of Jesus' body. After all, his tomb wasn't far away, and the men who put him there were almost certainly within in the city. Plus, as we've now established, there were guards present at the tomb, who could have also lead the curious to go see it." If you think that these arguments are weak, or that they don't point to the Resurrection, that's fine - we can certainly have the conversation. But I don't see a basis to claim that "the basic assumption here" is that "the gospels are correct in all detail." That assertion requires ignoring over half of what I wrote in the post. Joe, I didn't say anything about assuming that the gospels were inspired. I pointed out that if you assume they're accurate - then they're accurate. And that's what you're doing - you're assuming that documents written decades after the fact by folks in a different language contain a level of specific detail to allow one to determine that you're dealing with the word of god. My point is that if you allow that level of detail (and by the way, historians don't generally accept documents at face value the way you're doing here), then you have to admit the same consideration for the miracles of Vespasian; the revelations of Mohammed; the Rig Veda, the Upanishads, etc. But I'm not assuming that they're accurate, I'm arguing that they are (at least on these five details) on the basis of specific reasons (medical, historical, etc.). And I'd happily evaluate any of the texts you cite using that standard. But you can't just ignore everything I've written for why these five events should be treated as historical by claiming that I'm accepting the entire document(s) at face value... when I'm explicitly not taking that approach. I think I've answered thus indirectly, but you may have missed it. What you appear to be doing is making a claim for internal consistency: the events portrayed are medically explicable (the blood); the debate about guards (again, entirely internal - where are non-partisan documents exploring the other side? ); but demonstrating that the story us plausible (except for the divine elements) does not establish that the story is historical, and more than showing the Odyssey is internally consistent shows that it is historical? As for (3), we have Matthew talking about the story that "has been widely circulated among the Jews to this very day" that the Disciples stole the Body. Matthew isn't defending the story (he claims it's false), but acknowledging that it exists. Justin Martyr, in his Dialogue with Trypho the Jew also acknowledges it. Both Justin's and Matthew's original audiences would have known whether or not such a "widely circulated" theory existed or not. It would be a strange position to say that Justin and Matthew were making up the idea that the Jews claimed the Disciples stole the Body. *This is exactly the kind of analysis that I would suggest regarding something like the Odyssey. For example, the author's use of color words tells us a great deal about how color was understood in the ancient world -- Homer is one of the main sources for idea that the Greeks didn't have a word for, or a distinct idea of, blue. But where are the external confirmations? That Justin Martyr supports the gospels tells us little: he worked off his sources. Justin is dealing with Jewish criticisms directly in that work, so I think he constitutes an independent witness. Nevertheless, your point stands, inasmuch as the initial Jewish arguments are no longer existent (it's quite possible that they were never written). Admittedly, there are frustrating gaps in the historical evidence -- it'd be great to read what the Jewish high priests had to say, in their own words. But they don't seem to have written it down: quite possibly, they didn't take Christianity seriously enough at the time. But even barring this external confirmation, the historicity of the claim that the Jews were accusing the Christians of stealing the Body while the guards were asleep seems strong -- just because it could have been immediately rebutted by the audience (e.g., "No, we're not claiming that! We're claiming that there never WERE any guards posted). After all, both Matthew and Justin are writing to Jewish audiences. Um, no. They are writing to "Christian" audiences. Given the data we have, your comment that "they didn't take it seriously" seems the most parsimonious. Nobody cared. Certainly the important Jewish authorities didn't. Nor did the Romans. Justin wasn't a Jew, and he wasn't writing to a Jewish audience. He was an apologist to the empire. I know. Do you expect it to help? I don't mean that in a bad way, but I'm curious: Catholics presumably pray this every year, the world over, but the number of atheists and ungodly seems to be rising. What do you think is happening? I think that if you "sincerely follow all that is right" you are not *really* an atheist from the point of view of the Catholic Church. Atheists, and agnostics, and the ungodly have no excuse for not following all that is right, sincerely, do they? "No ones comes to the Father except through me." I think it's quite clear, from both the bible and the catechism that sincerely following what us right is completely inadequate to save one from being an atheist. And I'd say they have every reason to not follow what the Catholic Church thinks is right. Some of it is simply irrational. Much of it is arbitrary. And it's not just atheists, agnostics and the ungodly who don't follow what the Catholic Church thinks is right. There are all the other religions and a very large cohort of Catholics as well. Well, that is trouble for all of us, the non-believers, other religions and the very large cohort of catholics. I'm not sure how much trouble as "all that is right" is extremely vague terminology and there's no reason to think Kevin has a better clue than any of us about what that might be. The goal is to follow all that is *really* right. As I tried to say above, it is not strictly necessary that one actually always know what is objectively right. One can be in error. Nor is it strictly necessary to always succeed in doing what is really right. There is room for human weakness. What is necessary? The Church and reason teach that one's subjective merit or guilt is based on whether one has followed his or her conscience. If you do what you really think is right, there is merit in that, even if it is wrong. If you do something that you think is wrong and regret doing it because it was wrong, there is merit in that, too. So a Muslim honor killing has merit in the eyes of the catholic god? No, the killing does not have merit, but according to Catholicism (and, it seems to me, common sense and fairness), a person is not judged by standards he or she does not (and cannot) know, but by how faithfully the person follows the standards he or she sincerely believes to be right. If there is an all-good God, would you imagine him punishing people for doing what, through no fault of their own, they incorrectly believed to be good, or rewarding people who, through no fault of their own, the incorrectly believed to be evil? A person is not morally culpable for an immoral act unless he or she knows it is wrong and willfully commits it anyway. That does not make the immoral act itself good (say, an honor killing). Not so, according to Kevin: the Muslim is following his conscience and what he feels is the right thing to do. That has merit, per Kevin. And a conservative Muslim does not consider it an immoral act. See the Catechism of the Catholic Church 1790 ff. It does not help your case. You claimed there was merit in obeying one's conscience; but the catechism makes it clear that there is no merit in thst unless the conscience is formed according to the dictates of the church. Which again leaves atheists damned. And Muslims, and Jews, etc. Are you reading carefully enough? This is true, even if one's conscience is in error. Also from 1790: "Yet it can happen that moral conscience remains in ignorance and makes erroneous judgments about acts to be performed or already committed." That certainly doesn't sound like there is merit in execution of conscience if the conscience is (according to the church) ill-formed. You must obey your conscience. But you must also form it because it can be in error. Which again leaves atheists damned. And Muslims, and Jews, etc. But the Catholic Church does not teach that atheists, Muslims, and Jews are damned. Thomas Aquinas said that ""we ought to die excommunicated rather than violate our conscience." One might argue that a believing Catholic—by virtue of being a believing Catholic—already holds that the Church is infallible in certain matters, and that a believing Catholic is duty bound to subordinate his or her conscience to the Church's moral teaching. But first, it appears that Aquinas did not consider that to be true, and second, those who are not Catholic have no such commitment to submit to the Church. If they did, they would become Catholics. So it is just not true that the Catholic Church teaches that atheists, Muslims, Jews, or any others who are not Catholic are damned. People are bound by moral rules only if they know them or should know them and are somehow responsible for their own ignorance. But can any one argue - in this connected age - that anyone has any excuse of ignorance? I don't think so; and the catechism (as I recall) says only God can make an exception - one cannot say for certain that anyone is damned - but the basic point is clear: Christ is the only way to immortality. I'm starting to worry that when I get to the pearly gates St Peter will have my browsing history. I think this is well put, David. I'm sorry, but your answer seems confused. First you claim the killing does not have merit, but then you claim that it does have merit (as indeed, 1790 of the Catechism claims). So no matter how horrendous the act - genocide, torture, listending to Justin Beiber - it has merit in the eyes of god if the person is obeying his conscience. Kevin definitely claims it has merit. You claim it doesn't. My only comment here is that I don't think honor killings are generally done in the name of justice or righteousness but out of pride, which is, if I am not mistaken, a mortal sin. Not according to a conservative Muslim they're not. They are, for him, the MORALLY CORRECT thing to do. You may not like that, but to claim it's about pride shows a lack of understanding if Muslim culture. Well...I thought we were talking about sin in the eyes of the "catholic god"
I'll make a couple of points on that. (1) If we are talking about the person avoiding an eternity in hell, that might be true, assuming that the person, upon learning of the actuality of such sin, agrees that what he (or she) did is sin and truly repents of said sin. Perhaps the theory is that such a person, having committed the great sin of murder mistakenly thinking it is the right thing to do, has not completely damaged his soul to such an extent as the person who commits murder solely for, say, personal gain or for pride's sake (which I think a more likely cause of honor killings). A less damaged soul may be more likely to repent. (2) This does not get the person out of any just temporal punishment such as a lifetime in prison (or the death penalty, I suppose, although that is frowned on by many Catholics). I'll make a couple of points on that. The points you've made are similar to what David said. If honour killings are committed because a person believes it is the right thing to do or a group of innocent people are exterminated because a society thinks it's the right thing to do, we are not just talking about a person's culpability being mitigated, but actually giving "merit" to those actions. the person who commits murder solely for, say, personal gain or for pride's sake (which I think a more likely cause of honor killings). What do you know about honour killings and the cultures that consider them the morally just response? Not going to spend too much time on this since we have wandered far off the subject of the original article. However, I don't "know" what instigates every honor killing out there and given any individual case you would have to look at the circumstances, but desire to prevent shame to the family (I.e. pride) and patriarchal control over women (power) plays a big role in most cases. Not going to spend too much time on this since we have wandered far off the subject of the original article. However, I don't "know" what instigates every honor killing out there and given any individual case you would have to look at the circumstances, but desire to prevent shame to the family (I.e. pride) and patriarchal control over women (power) plays a big role in most case. As we can't spend much time on this off-topic discussion, then don't make assertions. I could say the same thing about catholic morality, that much of it is fuelled by pride and patriarchal control over women. Our consciences are shaped by our assumptions about goodness. That doesn't mean our decisions are morally exemplary, that they lead to goodness. Then you argue that an honor killing has no merit, but the perpetrator is NOT morally culpable? That doesn't answer my question. Let me be clear: you claim that god finds merit in honor killing and female genital mutilation because these are done according to conscience. I think David Nickol has adequately answered your question already (directly below this comment). Sincerely following all that is right is the part the atheist plays in his or her salvation. The goal is to follow all that is *really* right. The Church (and reason) teaches that one's subjective merit or guilt is based on whether one has followed his or her conscience. Sincerely following all that is right is necessary but not sufficient for salvation. A savior is still necessary. He is the "me" that makes it possible for one to come to the Father. What do you think is irrational or arbitrary? Thanks Kevin. I hope you and your family have a pleasant Easter. A theological/political question. Who does this prayer apply to in terms of other religions: Mormon, Protestant, Scientology, Jewish, Islamic, Buddhist, Hindu etc ? There are other intercessions for other groups. Everybody is included. Doesn't that create tensions with the other religions ? It can. I believe at one time Catholics prayed for the conversion of the Jews. My Jewish friends found it very offensive. I'm not surprised. It also seems like a strange thing to do from a political point of view when so many religions are supposed to be into interfaith dialogue. You would think there would be some kind of no poaching agreement. I don't have a Roman Missal handy but as I recall there are not prayers for many individual religions, but only a prayer each for the Jewish people, for those who do not believe in Christ and for those who do not believe in God. Afterwards, prayers are said for government officials, etc. The prayers for Jews and for those who do not believe in Christ no longer explicitly call for conversion, but rather make vague references to "faithfulness to the covenant" (for the Jews) and "finding the truth" (for non-believers in Christ), though those are not precise quotations. Similar prayers are said in the Episcopal Church and perhaps in some other mainline denominations as well. It can create tensions, but the Church has to obey Christ who instructed the apostles: "Go therefore and make disciples of all nations, baptizing them in the name of the Father and of the Son and of the Holy Spirit, teaching them to observe all that I have commanded you" (Mt 28:19-20). Happy Easter to you, Kevin. I was talking to one of my Catholic friends on Good Friday and he said he had given up beer for Lent. We talked for a little more and he said he had originally given up swearing and beer. Apparently, though, it's harder not to match someone who is swearing than it is to not have a beer with someone who is indulging in one. I completely understand! What a beautiful prayer. It is one of the most humanist prayers I have read. I would want anyone with Catholic faith to pray that for me. While at Easter (Latin) Mass this morning, and on seeing all the devout Catholics in the pews I recalled what impression I had as a child during the 40's. Although they were fewer in number from those days long ago, there was somehow more of a 'spiritual' or 'religious' sense than what I described in a poem I wrote as a teenager. Still in their human state called sin. Each arrayed in his Sunday best. It was rather the 'dance' they attended. Happy Easter to all the Catholics on this site, and for those scientists who look to the universe for inspiration, hey! it's really the dawning of Aquarius!!!! It seems the argument always boils down to this: "To those who believe in God, no explanation is necessary; to those who do not believe in God, no explanation is possible." It is interesting, too, that Mr. Dillon's avatar happens to be a pentagram. It seems the argument always boils down to this . . .
To which argument are you referring? 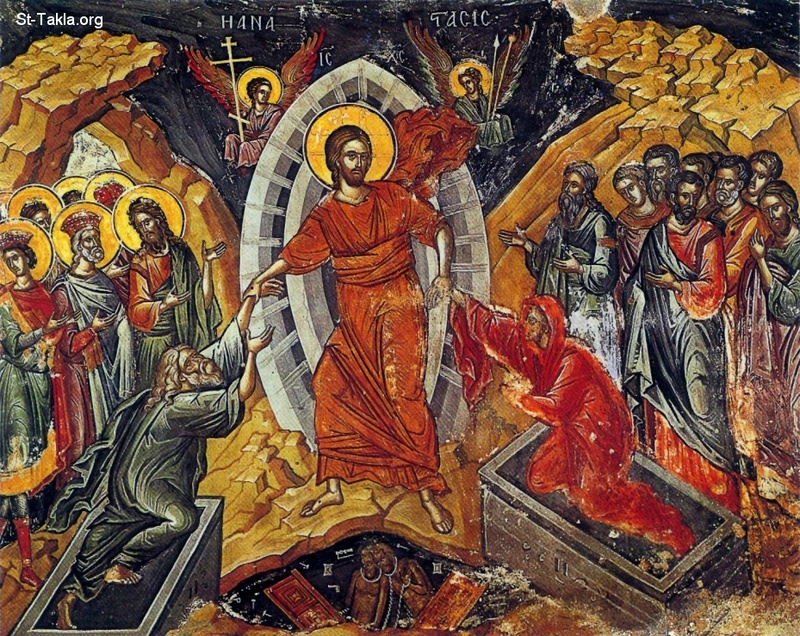 The historicity of the resurrection? There are hundreds of millions of people who believe in God (for example, Jews and Muslims) who don't believe that Jesus was God incarnate or that he rose from the dead. It is probably more nearly true to say that for those who believe in the resurrection, it is unlikely that any evidence will cause them to doubt it, and to those who don't already believe, it is unlikely that any evidence will change their minds. I believe and I need lots of explanation. To those who don't believe, if no explanation were possible then apologetics and even evangelization would be impossible, which is clearly false. That's interesting. What parts of your fatih require explanation (in your mind)? And I agree with your point about evangelization; clearly some people can be converted - whether through reason or through some other mechanism I don't know. Basically *everything* needs explanation. For example, when I wrote the OP on miracles, I had to struggle with how to even define what a miracle is and to discover and understand the process the Church uses to evaluate miracle claims. Even something like the Magnificat has layers of meaning. It took me years to get a grasp on the Beatitudes. And so on. But that simply isn't true. For atheists, it's more if a cases if being presented with arguments that all look like each other: every faith proffers the same kinds of arguments, the same claims. And they are arguments that don't provide empirical evidence that all - atheists and theists alike - can agree on. Faith is not founded in reason; it's been provided with post-facto rationalizations, but as yet no coherent arguments. But that does NOT mean that atheists aren't willing to listen. "Yet a first-century audience (that is, an audience which would have been able to call "shenanigans" if the authors were just making things up) believed these accounts, copied them, and spread them both textually and orally throughout the entire Roman Empire and to faraway places like India." This even occurs today when such audiences debate about the lives lost on the Death Star or how terrible Albus Dumbledore actually was. If you have the gift of faith then arguments like this aren't really necessary. People today know the difference between fact and fiction. Why do you assume people in the ancient world did not? Also, what is the parallel between chewing the fat about Star Wars and Harry Potter and having "faith"? Actually, there is a fascinating phenomenon called parasocial interaction in which people do things like take television shows (usually soap operas) so seriously that the believe—or at least act as if they believe—the characters are real people. They send them greeting cards on appropriate occasions (get-well cards when they are sick, and so on), send in baby clothes when a character has a new baby, and warnings when other characters are plotting against them. Here is a paper I ran across while googling. People certainly do not always know the difference between reality and fiction. It occasionally happens that a newspaper will report a story from The Onion or some other satirical source as truth. People believe the wildest political rumors, especially when those rumors discredit politicians they already oppose. Many of us wonder how in the world the Mormons could have believed Joseph Smith. Of course, according to the Catholic view, those who have spiritual beliefs and are not Christians, Jews, or Muslims believe in "fictional characters." That last is an excellent point. A billion Muslims believe - just as fervently as you do that their version of reality is true. According to Christians, they must all be delusional at best. Yet Christians rarely seem to exercise the same caution regarding their own beliefs. You could throw in some of the amazing conspiracy theories that abound on the internet as well as examples of the difficulty people have today separating fact from fiction. Part of is the question of who was going to call "shenanigans". We are talking about a handful of people at most who witnessed whatever occurred. And they were believers anyway. People today know the difference between fact and fiction. Obviously as an atheist I would disagree with this but this next sentence surprises me even more. Why do you assume people in the ancient world did not? The ancient world is full of myths and legends and gods descending to earth and Hercules and Zeus etc. Are you saying that they knew these stories were fiction ? People today don't know the difference between Anakin Skywalker and Barry Obama? In the ancient world, if someone believed in Zeus he thought the existence of Zeus was a matter of fact, not a made-up story. But don't you regard Zeus as a fiction? In which case aren't you accusing the ancients of not knowing the difference between truth and fiction? So, Zeus was a fact as long as enough people believed it? Sorry Kevin. I'm not insisting that that's what you're saying. Im asking for clarification. I'm trying to use fact and fiction in their everyday uses. Whether something is fact or fiction is an objective question. We can be subjectively wrong about whether something is a fact or is fictitious. So whether Zeus exists is independent of what people think about his existence. Due to our love for the truth, we hope that what we think agrees with what is actually the case. I think another related phenomena we still see today is the crediting of anecdotal quotes to famous people who were known for pithy or wise remarks. Such as Twain, Churchill, Einstein, etc. It's such a pity Churchill didn't say some of the stuff he's supposed to have said. He was pretty cool. Well *you* do, don't you? The question revolves around knowing the difference between fact and fiction, not whether some actual thing exists or not. If God exists he is a fact. If not, he is a fiction. True. But that's what we don't know. Or rather - theists accept the existence of god (whichever one their particular theism promulgates) on the basis of belief. Atheists lack that belief. Of the two, I'd rather deal with atheists because they are slightly and I emphasize that, less likely to deceive themselves about what the divine might want. Sorry Kevin. I'm not going out of my way to be difficult here. I just don't know what you mean. Maybe if you defined what you mean by "fact" and "fiction". The question revolves around knowing the difference between fact and fiction, not whether some actual thing exists or not. I think Kevin is making a distinction between the concepts of fact and fiction and what actual things fall into each category. You put God in fiction and he puts God in fact. You disagree about that but I don't think you disagree about what fact and fiction mean. I don't know enough about ancient times to know if they shared this distinction or if it was more confused. People in the mystical tradition like some Buddhists or people like Karen Armstrong seem to confuse what is a true fact and what is a fiction containing a "truth". I don't know if the world was more like that for everybody two thousand years ago. Actually, a lot of them apparently don't, if the reaction to The Da Vinci Code is any indication. John 20 : 9 ... this contradicts the claim of needing a guard? Non? "So the twelve disciples are either lying or actually saw the risen Christ. They're not just telling a pious legend nor are they confused about what they saw. There's just no way that they mistook something else for seeing, hearing, and feeling the risen Christ and watching him eat." Or it is just a story, or they were mistaken, or they were bamboozled by a clever fellow- remember they didn't recognized Jesus, he didn't look like himself. There are numerous permutation assuming this represents actual reportage by eyewitnesses (which it clearly is not). You are simply not trying very hard to think of other more prosaic options. Your presentation of these options is also deeply unfair to fair minded readers. You ask readers to either assume the very worst of the disciples (which doesn't seem reasonable) or to assume what you think is that opposite of that negative image. I picked this quote to lead with because it illustrates so very much that is wrong with the author's analysis. You are using the sources to justify the claims of the sources. And they are really poor sources. We simply don't know what happened after Christ was crucified, other than the likely conclusion that he died and was unceremoniously buried. The Gospels are terrible historical records and don't really allow an honest historian to say very much of importance about Jesus. 1. "sweat turning to blood"
The whole verse" And being in an agony he prayed more earnestly: and his sweat was as it were great drops of blood falling down to the ground." The text doesn't make it clear that he was actually, literally sweating blood. When he returns to his disciples, no one remarks on his bloody appearance It is also important to note that these verses (22:43-44) are not universally transcribed in the oldest and best manuscripts. But even if the text is actually describing hematohidrosis it would not do anything to substantiate the wild claims of resurrection that come later. It doesn't help that Luke wasn't penned until 80-100. This is very far removed indeed from the events it purports to describe and unlikely that its author knew anyone, present. It is not anything like a primary historical source. Gory details do not make the supernatural claims of the gospels true. If this were so, we would have to credit the Iliad with its accurate gore a great deal more like reliable history than historians are wont to do. Nor is the familiarity of the author with the details of crucifixion. This gospel also cannot be said to contain eyewitness accounts as they represent reporting that is very much after the events. I suppose one could go on in this way, but the bible, and particularly the Gospels (which in no way represent independent accounts) are not very good guides to establishing much about the life of Jesus. The Gospels don't agree on the conditions of the tomb or who found Jesus. Was it one woman or many? Was it light out or dark? John says darkness prevailed, Matthew says at dawn, and Mark agrees. Dawn ain't dark. Was the tomb opened when the woman, or was it women arrived? Was it closed? Luke, Mark, and John all say open, while Matthew says it was closed and adds a crazy special effects scene. All of the Gospels disagree on these accounts. The earliest copies of Mark end at 16:8 leaving Mary, Mary and Salome to run of the tomb from the strange man and presumably tell no one of what they saw. This I think makes for a more haunting ending, but it appears to have left later scribes unhappy with the resolve so they appear to have tacked on extra verses. In the earliest and best manuscripts the original ending of Mark has the women (n=3 in that account) don't see the risen Jesus, don't tell anyone about what they did see out of fear. And none of the other shenanigans ensue. The gospel accounts are further riddled in this way, and we probably don't need to labor over the point further. I'm well aware of the kinds of intellectual contortions that are made to rescue the accounts from their internal inconsistencies, but that kind of baseless hypothesis rescuing isn't very compelling. These are accounts are not examples of good history about Jesus, however much they may have of the flavor of his time. Herodotus gives us vignettes of life in his time somehow I don't think any of you who find the above essay compelling, will find Herodotus' accounts of the Gods as compelling. Or those of Homer because he accurately described the gory wounds produced by spears, arrows and chariots. It seems a basic question but you are much more familiar with biology than I am. I honestly don't know where to look it up. Wouldn't a people who butchered mammals on a regular basis have observed this regularly even if it was forbidden that they do it to human bodies? Is it unique to human bodies? If it is, Joe should keep the point. If it isn't, Joe should stand down on that point.
" And being in an agony he prayed more earnestly: and his sweat was as it were great drops of blood falling down to the ground." That suggests very heavy sweating. I wonder what it meant in Greek. It really doesn't seem to suggest that it was great drops of blood. In English, at least. These texts are not generally accepted as eyewitness accounts by disciples of Jesus. They may at times seem to be, but then so would any anonymous work or fiction written in the first person. Are these books even written in the first person? Anyway I think it is ridiculous to suggest that a disciple of Jesus was present when the Pharisees discussed having guards at the tomb or bribed these guards to lie. Just as the disciples of Jesus would not have been present at a trial of Jesus. I think it is more likely that the plan to guard the tomb was a fabrication designed to give credibility to the myth they were promulgating that the prophet they followed was some kind of deity that was not simply crushed by the Romans. I don't know if the author of Matthew believed these stories or made them up, but it makes no sense to me that he witnessed these conversations. I'm trying to find the medical evidence that explains what you mean. Some links would be helpful. I was having my first debate tonight about the resurrection. My interlocutor persisted that we ought not to believe extraordinary claims by illiterate people living 2,000 years ago. When I retorted that we have better attestation to the bible than any other ancient document, his response was the same. How do I move forward with this debate. I firmly believe that we have a lot of evidence for the resurrection and the historicity of Jesus (something my friend denies as well). Yet, my friend does not want to engage in the scholarly work because he says he cannot trust testimony. Yet, history is a discipline rooted in testimony. Anyway, thank you for this article. No, but it does rely on my believing what the church says about the New Testament's provenance. I believe I'm doing just that, but we may have a semantic issue here. I believe the documents are historical in the sense that they are relics of history. I do not share the church's belief that their authors were attempting to record history. it's clearly arguing for what were then recent historical events, not telling some long-ago legend. When I read read the New Testament, I don't find any argument for the proposition "These things really happened." I see narratives about Jesus of Nazareth, but I don't see any serious effort to convince the reader that they are factual narratives. Certainly, it's the answer that the disciples swear up and down is true. We don't have any disciple's word for that. We have the church's word that the disciples so swore. For that, too, we have only the church's word. The body does not metabolize water, even when it's alive. Jesus of Nazareth is crucified in Jerusalem in circa 30 AD. As he draws his final breath, the entire earth goes dark for three hours, a violent earthquake shakes dead people awake in their graves, and rips the Temple veil down the middle. Jesus' body is taken down off the cross and placed in the tomb of Joseph of Arimethea, a member of the Sanhedrin, the Jewish governing body which the previous night had voted unanimously to execute Jesus. The tomb is sealed with a large stone and Roman guards placed in front of it. Three days later, a second great earthquake shakes Jerusalem, causing the dead who had been shaken awake in the first earthquake to now come out of their tombs to roam the streets of Jerusalem and reconnect with old acquaintances; an angel (or angels) comes and rolls away the great stone in front of the tomb, causing the soldiers to faint and testifies to one, several, or many women that Jesus' tomb is empty; that he had risen from the dead. Jesus later appears to the Eleven, and eight days (or forty days) later, ascends into heaven from a mountain in Bethany (or Galilee, or from the Upper Room in Jerusalem). The resurrection appearances of Jesus so emboldened the previously easily-frightened, doubting disciples that they now boldly preach the gospel of Jesus in the temple, Judea, and the world, dying martyrs deaths, refusing to recant their eyewitness testimony that they had seen the resurrected, walking/talking body of Jesus. These same disciples soon write the Gospels and several epistles that would soon become the New Testament of the Bible. The Gospel of Jesus spreads like wildfire, even though furiously persecuted by both the Jews and Romans, to become the dominant faith of the Western World for two thousand years. Jesus of Nazareth is crucified. He dies. His body is left on the cross for days, as was the Roman custom, to warn any other "King of the Jews" pretender to think twice about stirring up trouble. After a few days have passed and the birds, dogs (Roman crosses were low to the ground), and other carrion ravaged the body, the remains were taken down at night and tossed into an unmarked common grave---a hole in the ground--- with the bodies of other criminals executed that week. The location of this common grave is known only to a few soldiers, as the Romans do not want to give the "King of the Jews" a proper burial nor do they want a known grave to become a national shrine where Jews could later come and pay homage to their "King", possible inciting more trouble. Jesus disciples who were already in hiding, go home to Galilee to take up their prior professions---fishing or collecting taxes. The small band is devastated. Their beloved leader is dead; their hopes of reigning over the New Kingdom on twelve thrones with Jesus are dashed to pieces; there will be no overthrow of the hated Romans after all. All hope seems lost. Then...months or a few years after Jesus' death...a couple of women disciples see a man in the distance, at sunset, and in the silhouette of the fading sun...he looks like Jesus. Is it Jesus? He turns to them, waves with his hand, and then disappears behind a hill. "It was Jesus!" they exclaim. They run and tell the disciples. Soon other disciples are "seeing" Jesus. "He is risen, just as he said he would!" The disciples are thrilled! They WILL reign in the New Kingdom after all! They begin to preach the Gospel of Jesus, telling everyone how he has risen from the dead, as he promised. ...and forty years later, after Jerusalem has been destroyed and most of the disciples are dead, a Greek speaking Christian in Rome writes down the story of Jesus. However, the version of the oral story that this man hears circulating in Rome tells of an empty tomb, the tomb of a member of the Sanhedrin, ...so "Mark" writes down the story. A decade or so later, "Matthew" in another far away location and "Luke" in another, write down the story of Jesus. They borrow heavily from "Mark's" story, from another common source (Q), and from other sources that they do not seem to have shared. For instance, "Matthew's" story contains incredible supernatural tales, such as an earthquake occurring when Jesus died, causing dead people to come back to life...but they don't come out of their graves until three days later! One wonders what they were doing in their tombs for three days! And two thousand years later, every Christian on earth believes that the stories written by "Matthew, Mark, Luke, and John" are the historically accurate accounts of the life and death of Jesus, when all they are are legendary stories. No one lied. No one made anything up. It's a legend. Now, dear Christian, how many supernatural events such as dead people coming out of their graves and walking around town have you seen in your life? Not many, have you? And how many times have you seen a simple story about a car accident or someone's mysterious death, turn into the wildest tale, with all kinds of miraculous claims, develop in just a matter of days? So, honestly, friend: Which of the above two stories about Jesus is much more probable to be true?